This is a method rather than a rigid recipe and you can choose whichever spring vegetables you prefer. I have used green vegetables as to my mind green is the colour of spring. The vegetables are added late and cook slightly in the heat of the almost finished product which keeps them fresh and spring-like. 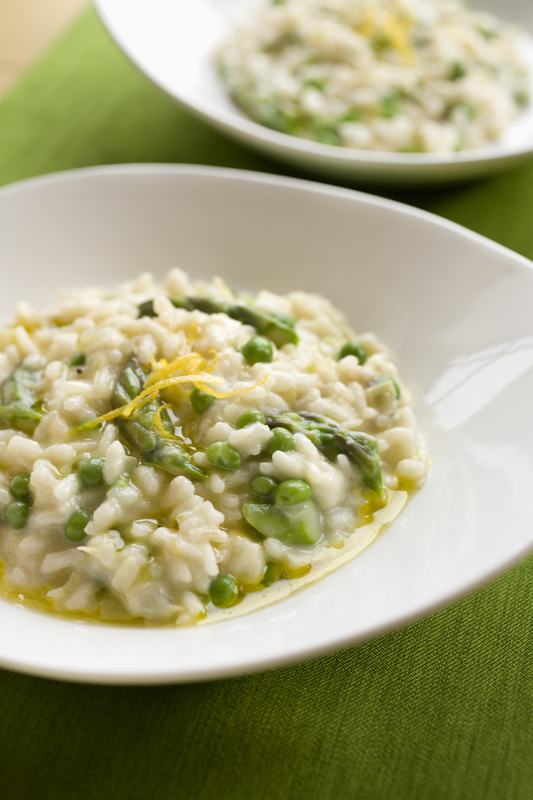 The making of risotto is often seen as a big commitment because of the continual stirring but in reality it’s 20 minutes of your life and what’s that for a delicious homemade meal? Place the vegetable stock in a suitably sized saucepan and bring to the boil. Once at the boil, reduce the heat to a simmer and keep the stock at this level. Snap the woody ends off the asparagus spears, rinse under water and place in a bowl and pour over enough boiling water to cover. If using fresh peas, blanch these also. Remove the vegetables after a couple of minutes and set aside (The resulting ‘stock’ can be added to the vegetable stock). Heat half of each of the oil and butter in a heavy based ovenproof pan on the hob. Add the garlic and onion and fry very gently until the ‘raw’ garlic odour becomes fragrant and the onion is translucent. Add the rice and gently ‘fry’ while continuously stirring for around five minutes. This seals the rice grains and controls the starch release. Turn the heat up a little and add the wine and stir continuously until the wine has almost evaporated. Reduce the heat again and then start to add the stock - around 150ml (a ladleful) at a time and stir gently and frequently until the liquid has almost been absorbed. Keep adding stock as above until around two-thirds of the stock has been used then start to check the ‘doneness’ of the grains. The rice should be cooked through without an obviously starchy bite but retaining some texture – ‘porridge’ is not the aim! There should be a creaminess, with no ‘loose’ liquid. As the potentially last ladleful of stock goes in to the pan chop the spring onion, mange tout, split the beans and add these along with the asparagus, peas and pine nuts and fold into the rice. When you are happy that the rice is cooked, remove from heat. Add the remaining butter, some of the olive oil, the parmesan and the chopped herbs along with salt and pepper to taste. Add a little more olive oil if you feel the rice is a little stiff. Tips & Advice: *Rice is a natural product and although a ‘dry’ product, it will potentially be drier towards the latter part of its shelf-life than when first packed. This will affect the amount of liquid it absorbs as will the weather conditions prevalent during its growing and storage period. This is why Risotto needs all of the attention described above to achieve a good end result. ** The most convenient way to make Parmesan shavings is to use a vegetable peeler! !